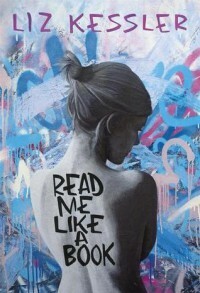 If you're looking for a book to celebrate LBGQT month, look no further than Liz Kessler's Read Me Like a Book. This is a book on the lighter side. It celebrates the awkwardness of being a teenager, the beauty of discovering who you really are, and the strength that comes in sharing that with others. While it may not be the most serious book I've read on this subject, I can guarantee that it'll be a quick and enjoyable read. Kessler has written one quirky character in Ashleigh, and I think that's what I liked most about her. She's the teenager who is caught in the middle. Caught in the middle of her parents, who seem to be on the road to divorce. Caught in the middle of wanting to hang out with friends, but also wanting to please her mother and do well in school. Now, as an extra layer, Ashleigh is caught in the middle of who society tells her she should be and who she thinks she might actually be. I liked Ashleigh a lot. She was adorable, awkward at times, and just too honest for her own good. The fact that the person who made her realize her full potential was a teacher, also made me smile! I have a soft spot in my heart for that. My only qualm with this book was that it's a bit thin. A lot of things transpire in a very short amount of time, which doesn't leave much room for it all to be laid out and resolved. Now, I'm not saying that life is by any means clean when it comes to timelines. However, it made getting to know Ashleigh, her parents, and her friends, a lot more difficult. They ended up being a bit more transparent than I would have liked, because they were so busy pushing towards the ending that I knew was coming. I'm all about a happy ending, and I'm so glad that Ashleigh was given hers. I only wish I'd had a bit more time to enjoy her crazy journey, and rejoice in her decision to be true to herself. As I said before, this book is lighthearted. It's a relatively easy journey through what it's like to bumble through realizing your sexuality. Ashleigh is presented with questions, yes. However she's also lucky enough to be surrounded by all manner of people who love, and support her. This might not be the case for everyone who is heading towards their coming-out moment, so I know some people will decry this story for being too simple. I think this kind of story is important though. It shows that the world isn't always a big, bad, and scary place. Sometimes it's just a little rough to realize that.